Spokane's annual Labor Day weekend food-and-entertainment festival Pig Out In The Park starts at noon today, Sept. 2, in downtown's Riverfront Park and extends through Monday, Sept. 7. Entering its 30th year in existence, Pig Out features 55 music acts over the course of the six-day celebration, 42 food booths and 3 adult beverage gardens. Acts playing this year's Pig Out include local fan favorites - including Too Slim and the Taildraggers, Trailer Park Girls, No Expectations, Java Kola and Civilized Animal, as well as one-time national chart toppers Cracker and The Tubes. Admission is free, and meals cost no more than $8.95; that's less than last years' price. Thanks to Bill Burke and Val Workman for another great event! For more information, go to www.spokanepigout.com. When in doubt, refer to the manual and follow directions. The Inlander has released the sixth edition of its Annual Manual magazine, the largest publication ever produced by Inland Publications. With 220 pages dedicated to food, shopping, nightlife, recreation, arts and family, it's the insider's guide to the Inland Northwest. Like the Inlander, this glossy magazine is free, and distributed at the more than 900 locations in the Inlander's distribution network. So look for the Annual Manual where you pick up your Inlander. 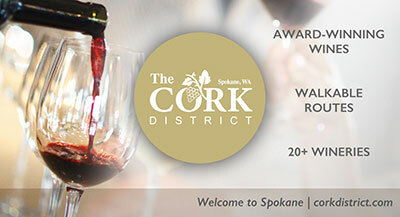 Pick up several and send them to your out of town friends to show them just how fun Spokane is. You can also check out the 2009-2010 Annual Manual at www.inlander.com/annualmanual. The Copper River salmon are running at Spokane Falls. Here's one last chance to enjoy fresh Silver Salmon from Alaska's Copper River. The King's are available in the spring; these are silvers, and they're just as delicious. For a limited time, Anthony's at the Falls, 510 N. Lincoln is offering this delicacy for just $17.95. And as far as we know it's the only place in Spokane you can get it this time of year, because Anthony's has its own seafood company. Anthony's phone number is 509-328-9009 and their website is www.anthonys.com. What happens in Vegas stays in Airway Heights. The variety show "Welcome To Fabulous Vegas Nights" takes the spotlight at the Northern Quest Resort and Casino starting at 7:30 p.m. tonight, Sept. 2, and runs through Sunday, Sept. 12. A show is scheduled every night except Labor Day Monday. Dubbed the ultimate variety show, "Vegas Nights" juggler Michael Holly, balancing star Tino Ferreira, magician Fielding West, twirler Jonathan Burkin and comic hosts Tony and Lloyd. Tickets are $40 each for cabaret-style seating and are available by calling the Northern Quest Events Line at 509-481-6700 or through Tickets West at www.ticketswest.com or 509-325-SEAT. Mary, don't let the music die! A complaint from one cranky neighbor has hushed the live music at the Rocket Market at 42nd and Hatch for the time being. Owners, Alan and Shanda Shepherd have been offering live music for several years and have done everything possible to keep the volume down and keep the peace. Som Jordan has been booking music there this year and would like to be able to finish the season. And they'd like to change the law that killed the music at the Rocket. You can help. Contact Mayor Mary Verner at 509-625-6250 or email her at Contact the Mayor via Ask Spokane and urge her to keep the music alive. Also, get in touch with City Council Member, District 2, Michael Allen at mallen@spokanecity.org. He's supportive, and he's trying to find a solution, but could use your encouragement. Discover Tan and other colors at the Tinman. The Tinman Gallery, 811 West Garland, will host an artist's reception for Ilse Kilian Tan this Friday, September 4th from 5 to 9 p.m. Her show of new work, called "Discoveries in Color," will run from September 4th through September 26th. This new series of over 20 canvasses depicts landscapes that Ilse has visited numerous times in life and in memory. Since she paints from memory, her work has a layered, luminous feel that is the sum of all her experiences. Refreshments will be served and there will be a background of live music. 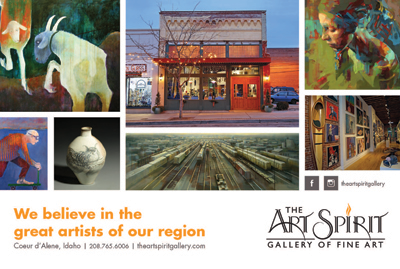 For more information contact Sue Bradley, owner of the Tinman Gallery, at 509-325-1500. Park it for one last Symphony show. The Spokane Symphony will end its Summer Series with two free concerts in parks. The Lud Kramer Memorial Concert, named for the beloved Liberty Lake resident and former Washington Secretary of State, will be at 6 p.m. Saturday, Sept. 5, at Pavillion Park, in Liberty Lake. The same lineup - starting with "The Star-Spangled Banner," including Beethoven and Mozart and closing with John Philip Sousa's "Stars and Stripes Forever" - will be performed at 6 p.m. Monday, Sept. 7, at Comstock Park on Spokane's South Hill. For more information, go to www.spokanesymphony.org. If you want to see Topol, you can't fiddle around. The stage production of "Fiddler on the Roof" starring award-winning original movie actor Chaim Topol continues its run at the INB Performing Arts Center tonight, Sept. 2, through Sunday, Sept. 6. Shows start at 7:30 p.m. tonight and Thursday and at 8 p.m. Friday through Sunday, with 2 p.m. matinees on Saturday and Sunday as well. Tickets are $30, $52 or $58, and are available by visiting the INB Performing Arts Center box office or through Tickets West at www.ticketswest.com or 800-325-SEAT. Walk the walk and talk the art. Downtown Spokane's First Friday Artwalk kicks off at 5 p.m. Friday, Sept. 4, with 50-plus restaurants, shops and other downtown businesses featuring art and live music. The Kolva/Sullivan Gallery, at 115 S. Adams, presents artist Melanie Gum's inaugural show, titled "The Essence of Surfacing." The Missing Piece Tattoo, at 410 W. Sprague, will throw its second annual cancer ribbon tattoo fundraiser, with 30 percent of proceeds going to Cancer Patient Care. For more information on the multitude of exhibits and other events associated with First Friday Artwalk, go to www.downtownspokane.org. Showing off Spokane and Coeur d'Alene for 10 years. Spokane Coeur d'Alene Living Magazine celebrates its 10th Anniversary with their 64th issue, in mailboxes and on newsstands now. The September issue contains a compilation of "What I Know" items from 20 Spokane luminaries published over the past 10 years (including Betsy Cowles, Don Kardong, Mari Clack, and Cathy McMorris Rodgers), as well as every cover since the magazine's inception in July 1999, when it was called Spokane Home and Life. The 164 page magazine also features the Fall Arts Preview and the 2009 list of Spokane's Best Lawyers (provided by Avvo). The website is www.spokanecda.com. Don't be rude. Go see Rude. The Northwest Museum of Arts and Culture, at 2316 W. First, premiers an exhibit by Brad Rude, considered one of the region's preeminent young sculptors, on Friday, Sept. 4. Titled "Days Together: Selected Sculpture and Paintings," Rude's work focuses on wildlife sculpture, a mainstay of Western art, and will be on display at the museum through Oct. 24. For more information, go to www.northwestmuseum.org or call 509-456-3931. Modest Mouse - Issaquah's finest, Modest Mouse, has led the way in the delicate balancing act that is indie-bands signing with major labels. And since the 2004 release of the platinum-selling "Good News for People Who Love Bad News," Modest Mouse has been able to maintain its indie-cred, making strides in dissolving the lines between the Northwest indie-rock aesthetic and the commercialization of independent music. With two drummers, plus the former guitarist for The Smiths, Johnny Marr, - not to mention, Isaac Brock, one the most charismatic personalities in indie music - Modest Mouse is five albums, and 15 years into its career and just hitting its stride. Modest Mouse returns with The Night Marchers at 8:30 p.m. on Saturday, Sept. 5, to The Knitting Factory Concert House, 919 W. Sprague Ave. Cost: $32. Michael Franti and Spearhead - As the leader of eclectic and superconscious hip-hop-funk-rock-reggae-jazz band Spearhead, Michael Franti is on a mission to change the world through art. The film, "I Know I'm Not Alone," is his latest call for peace and social justice, and features footage of Iraq and Israel, but he's still making innovative, genre-hopping music. Franti's latest, "All Rebel Rockers," has a lot of crunchy guitar moments, but its steeped in reggae rhythms. The album was recorded largely in Jamaica with the help of dancehall kings Sly and Robbie and co-stars multi-talented vocalist Cherine Anderson. Franti is joined by Anderson as a special guest on his current tour, which arrives at 8 p.m. on Tuesday, Sept. 8, at The Knitting Factory Concert House, 919 W. Sprague Ave. Cost: $27 in advance, $30 day of show. David Allen Coe - For most of his career, "Mr. Take This Job and Shove It," David Allan Coe has been at the heart of controversy - if not the lungs, liver and solar plexus. The infamous outlaw country singer is still at it, touring regularly, and he comes back at 8:30 p.m. on Wednesday, Sept. 9, to The Knitting Factory Concert House, 919 W. Sprague Ave. Cost: $25. Maia Sharp - At the age of 12, Maia Sharp was playing piano, saxophone, oboe and guitar. She's written hits for Trisha Yearwood, Bonnie Raitt, Art Garfunkel, Cher, and The Dixie Chicks. And this summer she released her fifth studio album, "Echo." Sharp plays a rare seated show at 8 p.m. on Thursday, Sept. 10, at The Knitting Factory Concert House, 919 W. Sprague Ave. Cost: $12. The Sky Turns Red - Coeur d'Alene metal band Sky Turns Red contains former members of Riled that have performed with national acts such as Drowning Pool, Seven Mary Three, Adema, and Psycho Stick, among others. They landed a deal on UK-based indie champion Swerve Records, and are celebrating the release of their new album at a CD release show with Sweet Hollow at 7 p.m. on Saturday, Sept. 5, at The Grail, 4720 W. Seltice Way in Coeur d'Alene. Cover: TBA. Irish Multi-Media Presentation at the MAC. "The Rambling Irishman" a multimedia program of Irish Film, Dance, Music and Readings will be presented at the Northwest Museum of Arts and Culture, Friday, September 18, featuring the film, "The Hard Road to Klondike" by Irish filmmaker, Desmond Bell. Reception and Crossroads Dancing: 5:30 - 6:45pm; Program: 7:00 - 8:30pm. Cost of $7.00 includes one drink. The film is based on a book about Mickey MacGowan and his travels from County Donegal, Ireland to Butte, Montana then Alaska and the Klondike Gold Rush. He made his fortune and returned to Ireland in the 1890s. Also included is a program of traditional singing from Irish TV. The reception will include The Kelly Irish Dancers with demonstration and instruction of Crossroads Dancing with live music. For more information, visit www.northwestmuseum.org. Ticket special gives new meaning to Urban revitalization. A ticket special for the upcoming Sept. 14 Keith Urban concert at the Spokane Arena is planned during the Labor Day weekend. From 10 a.m. Friday, Sept. 4, to 10 p.m. Monday, Sept. 7, fans can buy a four-pack of tickets to the Urban concert for $99, almost half off the regular price. The special is available for 200-level seats only. To order, go to the Spokane Arena box office or go through Tickets West at www.ticketswest.com or 800-325-SEAT. The popular museum exhibit "Out Of This World: Extraordinary Costumes From Film and Television," will be on display only for a few more days at the Northwest Museum of Arts & Culture, at 2316 W. First. Saturday, Sept. 5, is the final day to see more than 30 costumes and related objects from popular shows such as "Star Wars," "Terminator," "Star Trek," "Indiana Jones" and "Batman." The museum is open from 10 a.m. to 6 p.m. today, Thursday and Saturday and from 10 a.m. to 8 p.m. this Friday. For more information, go to www.northwestmuseum.org or 509-456-3931. The Cougs will be seeing red with the Cardinal comes to town. The Washington State University Cougars football team kicks off the 2009 season with a home game against division opponent the Stanford Cardinal at 3 p.m. Saturday, Sept. 5, at Martin Stadium. The Cougs lost to Stanford last year in Palo Alto, but beat the Cardinal last time the team traveled this far north. Tickets range in price from $20 to $40 and are available at www.wsucougars.com. EWU Eagles look to soar over Western Oregon. The Eastern Washington University Eagles football team will open their 2009 season at Woodward Field, in Cheney, at 12:05 p.m. Saturday, Sept. 5, against the Western Oregon University Wolves. The Eagles are coming off a 6-5 winning season with 15 returning starters. Tickets to the game range in price from $10 to $18 for adults and $4 to $8 for children. For tickets, go to www.goeags.com or call 1-866-4GO-EAGS. "Well, Sisk felt that since Mr. Farnsworth was pretending to talk to someone, he might want to pretend to give him cocoa, too." Name the movie that line appeared in to win a gift certificate to the Cathay Inn! Send your best guess and your phone number to info@entertainmentspokane.com. The winner will be selected at random from correct entries and will be announced in next week's e-newsletter. The deadline for entries is noon on Friday, Sept. 4. Last Week's Winner: Patrick O'Brien knows Footloose! Last week's movie quote was, "Hey, I like that hat, man. They sell men's clothes where you got that?" O'Brien correctly guessed that it was from 1984 blockbuster "Footloose."